← Friendly Reminder: Inner Sunset Clean Up Day is Saturday, March 20th at 9am! What a surprise. That bill in the Legislature to get the Governor and, um, the Legislature to follow the laws they broke when they stole money from the gas tax that pays for roads (80%) and transit statewide (20%) was vetoed by the Governor. As always, the reporting on this can range from good (as in the Examiner) to spotty (as in elsewhere) as it was represented this was a plan to just “give” state transit agencies a goodie, and now the goodie isn’t coming to them as planned. Bullsh*t. Voters have repeatedly indicated that they’ve voted for gas taxes to pay for things related to transportation, be they roads that everyone uses, or to a lesser extent mass transit (to ensure that we’re not stuck in a perpetual gridlock). The courts have repeatedly ruled that the Governor/Legislature’s actions are illegal, and that said looting can’t happen anymore, so it was a bit of Sacramento style nonsense that suggested a bill has to be passed again to make the Governor stop breaking the law. But that’s what was decided, and as anyone with a clue predicted, Governor Doofinator vetoed the law. to try and fix the damage done – even if this new bill wasn’t reinforcing existing law, but just trying to get some modicum cash back to transit agencies, without the guarantees of the voters’ original ballot measure. In other words, it was a bad solution to a situation (the Governor’s illegal raid) that never should have happened in the first place. Typical Sacramento nonsense. The MTA has to divorce itself from Sacramento as a source of funding altogether. Too bad that’s made more complex by the fact that Sacramento (and you, the voters) make it so difficult to exercise local funding control, we’ve become dependent on Sacramento to re-distribute property and income taxes. If the Democrats in the Legislature want to be enemies of local government, fine, but why can’t we fight back and let them keep on screwing things up, and at least be able to go it alone and find a saner way to pay for things, instead of just borrowing via bonds? Or is that just crazy talk? In my haste to post something, I made a mistake in this post, which was corrected. I’d like to thank Reader John for pointing this out, and I apologize for the error. This is what happens when I post so quickly and don’t have the time (due to “real” paying work) that I normally take to write a post for you, the reader. And unlike some in the print or other media, I’m not afraid to fix my mistake and say so. I realize that in the Internet that means I’m showing some sort of “weakness,” but whatever. Wouldn’t it be possible for Brown to step in at this point and say “um, actually there’s laws you have to follow and stuff”? Yes, but Jerry would need some courage. I’ve never held myself out to be perfect, and I try to be as careful as I can, but everyone goofs once in a while. Unfortunately after one admits an error there’s always someone nyah nyah nyah ing at you for no good reason. Whatever! Also once this thing I’m working on is done, I will be amending another post as well based on some new information I recently found out that was VERY interesting! The best thing about internet journalism is that it’s so easy to correct inaccuracies, and since a lot of it is for the historical record, that’s been a particular boon. I’ve never understood this need to cross out the original so that the reader can see you’ve changed something. It’s not like you’re trying to pull the wool over anyone’s eyes. You’re merely trying to leave an accurate record, unlike all those printed inaccuracies in newspapers and magazines that pass for the historical record to this day because it’s too expensive and difficult to correct them. And thanks for the call for local funding for transit. 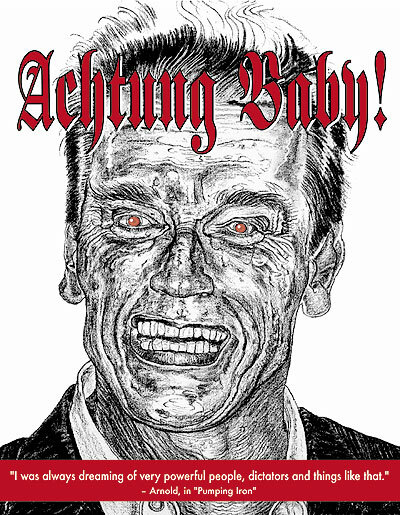 Schwarzenegger and everything he represents has been a total disaster and it’s going to take some time to recover. Correcting a mistake is a sign of weakness? I guess that’s the difference between a blogger and a real journalist. By the way, despite widespread reporting to the contrary, the bill has not been vetoed. He’s only threatened to veto it if he doesn’t get what he wants in other bills that have nothing to do with this one. “real” journalists rarely own up to their mistakes. (look at the revelations about how the msm fucked up reporting on ACORN, the health care bill and so forth – they either refuse to admit the error or bury that on the obituary page. The Chron routinely gets things way wrong and when called on it just ignore the critique.) Mainstream print folks also never give credit to online sources when said online sources scoop them on basic news (don’t get me started on that one). The Governor’s threat might as well be a veto. In the LA Times this morning it was reported that both the Gov and the Dems regard looting transit as an “easy” fix for their inability to manage finances under our Byzantine system, and I have no doubt that he’ll do it again. Pay transit back $3billion by court order? Where will the money come from? A Republican governor with a fleet of Hummers transit friendly? I’m not holding my breath.